The Brownfield Coalition of the Northeast (BCONE) joined forces with the New York City Brownfield Partnership (NYCBP) and the NJ Licensed Site Remediation Professional Association (LSRPA) at NSCW to discuss the services each non-profit provides to communities, non-profit groups, and students. All three organizations award annual scholarships to undergraduate and graduate students; each has some version of a “pro bono counseling program” for communities and/or organization members. All three groups have scholarships to give, but that the overall feeling is that they could do a better job of getting the word out. On important difference pointed out by Ernie Rossano of ERM, who is the current President of the NYCBP, is that that the Partnership works closely with the NYC Mayor’s Office of Environmental Remediation (OER). Sue Boyle of GEI Consultants, Inc, and the contracted Executive Director for each of the organizations reiterated how important it is to form a good relationship with a local government agency; in the case of the NYCBP, OER has resources to get the word out and when it hears questions about brownfields, they can send them to the Partnership. A lot of times small developers and properties owners are unfamiliar with the government and possibly even scared of going to the government. So it’s extremely helpful to have the Partnership as a non-governmental group that can work with interested parties and developers. Denise Nickel of the BCONE Advisory Board emphasize how important it is to to constantly work on different avenues to get the word out on the services available from non-profit organizations like BCONE, NJLSRPA and the NYCBP. She reiterated what the NSCW participants shared: that there is a need effective marketing and constant marketing. Suggestions from session participants included working with the League of Municipalities, participating in an annual summit with the State Legislators and other members of the state government. Another suggestion was to go to the State Legislature once a year because the legislature often devotes an entire day to listening to groups and organizations about what they do and how they can be of benefit to the state. Regarding scholarships, the topic of contacts within colleges and universities was suggested by several participants. Further, they broke down the individual departments within the university that needed to hear about scholarship resources available. For example, establish a contact in the business school, in the engineering school, and in the environmental courses and programs that universities and graduate schools have. Ernie Rossano of NYCBP mentioned that establishing the right individual person contact was key, that the NYCBFP had reached out to financial aid without much success. He and others agreed that the most important individual contact to get the word out would be individual professors, such as faculty advisors to students getting their masters or doctorate degrees. Regarding outreach, one participant mentioned that the Association of Associations could be tapped to multiply the network of people who can get the word out. Another participant suggested that when academics send out requests for interns for their offices, that this would be a good time to send out scholarship information as well. Still another participant suggested a process of constant contact. She said there are three things that worked well. First, send out scholarship information way far in advance. Second, keep lists of everyone that you’ve worked with, any organization or any school worked with. Third, determine five touch points to remind people. This was especially important. Her organization found that five reminders was the right number to get people to attend events, turn in applications, or complete anything that had a deadline. Social media came up as an important way to get the word out. Additionally, a participant suggested going to sororities and fraternities, or perhaps to one of the meetings of the Greek Society (an organization representing all the sororities and fraternities on campus) with scholarship information. It was also suggested that it might not be too early to give information to high school counselors know about the availability of these scholarships for their pre-college senior counseling. NSCW attendees were provided the USEPA Venn diagram, the “Universe of Contaminated Sites” as a tool to understand the different types of sites and their magnitude in the contaminated sites universe of NPL sites, LUSTs, CAMUs, SMUs, and AOCs. 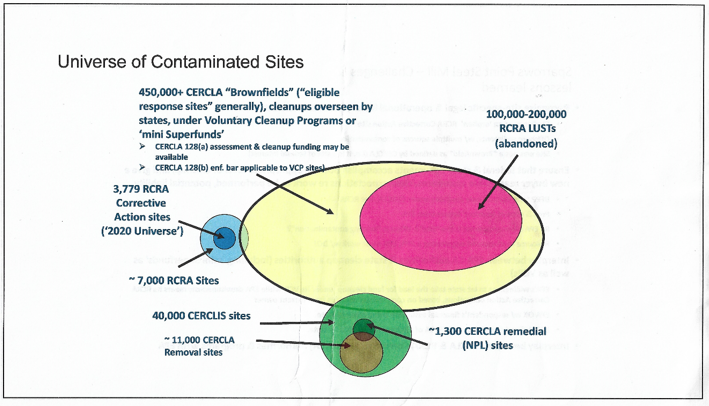 USEPA doesn’t give brownfield funding money to RCRA and CERCLA remedial sites. But, USEPA realizes the great economic benefits of redeveloping sites and putting them into beneficial reuse. Moreover, the Build Act of 2018 amended the Brownfields law and added more money to get sites into reuse. The Superfund Task Force, which NSCW speakers Charles Howland of USEPA and Colleen Kokas of Environmental Liability Transfer participate on and have spoken about and written about for BCONE, is encouraging redevelopment. Gloria Sosa of USEPA Region 2 noted that there are many different parties interested in redeveloping sites. Unlike brownfields, with Superfund the timeline is of utmost importance because by the time the Reasonable Anticipated Future Use (RAFU) decision is made, one cannot go back and change the remedy for changes in redevelopment use. The Record of Decision (ROD) is a point at which the RAFU is considered. Elizabeth Barton, Esq. of Day Pitney emphasized practical aspect: she said that from the trenches, cooperation is priceless, not just state and federal, but also between agencies and even within agencies. Without cooperation, you end up like a” ping pong ball going between floors to get a project done.” Beth also reminded the group that last year New York State overhauled its waste management regulations to enhance availability of beneficial reuse with regard to clean fill use on sites. One of the benefits of this is the finality that comes with fill that meets the health standards and then is no longer considered solid waste. The NSCW session Revitalization of Old Industrial Sites for Multiple Reuse, was filled with great ideas and insights. Think about how quickly technology is changing and how these high-tech changes can coalesce with brownfield remediation to create walkable/sustainable communities. Many believe walkability is the key to sustainability and how high-tech can help us achieve sustainable communities. The Internet of Things (IOT) is coming at us fast. Eventually everything will be connected by the IOT and reality will be augmented with information about objects and real estate. Rory Johnston, Langan’s Principal Vice President for Environmental Services told NSCW attendees that the IOT will dominate our world and will transform how we plan and use real estate. A part of this transformation will be having residential near light industrial. With new manufacturing methods like 3D printing, having residences nearby is possible. There are no smokestacks or loud, dangerous industrial processes associated with 3D printing. As a light-industrial use, 3D printing holds great appeal to millennials who will want to live and work within a walkable, attractive urban core with neighborhood schools. Think beyond our old perceptions of industrial uses. For example, battery storage connected to the grid with solar panels and distributed generation plus new generation batteries could be a homerun for a redeveloping brownfield. NSCW participants heard about Shell’s multi-million investment in Beaver County where the Cracker facility created $ 3-4 billion in additional investment. The significance of the Cracker is that within 70 miles a full 70% of the HDPE processors are co-located because of existing infrastructure like multiple rail lines. This ease of transportation will create roughly $5 billion of more redevelopment investment for commercial and residential purposes, essentially allowing brownfield redevelopment all along these properties. Often the key to redevelopment is having a lynchpin industry come into the area like the Cracker facility for the processing of natural gas for the production of polyethylene. In the session Revitalization of Old Industrial Sites for Multiple Reuse, Colleen Elliott of Langan focused on the 700 mile radius around the Shell petrochemical complex which includes New York, New Jersey and Eastern Pennsylvania and the opportunity all around the Pittsburgh region. In March of 2012 this region was identified as a redevelopment corridor. Less than six years later, Shell broke ground on a $6 million project for 1.5 million tons of ethelyne and 1.6 metric tons of polyetheyne production per year. Located in Potter Township, the site has 80+ years of economic activity as a lead and zinc smelter. From a transportation perspective, it is a valuable site because of the rails, water, highways, energy and other infrastructure making it ideal to repurpose. By 2017 Shell remediated 7.2 million pounds of contaminated dirt. Large properties make redevelopment very viable because of the luxury of space. The complex will feature a cogeneration unit where 2/3rds will be used by Shell and 1/3rd will go back into the grid. Community outreach and education to describe the advantages of capping a site for reuse limits the need to transport material offsite and offers a more sustainable remedial option than incineration and the impacts resulting from that technology. Natural gas is providing the baseline energy production to fuel the Brownfield redevelopment renaissance in Pennsylvania. This renaissance as occurring in three generations, according to Brian Clark, Esq. of Buchanan Ingersoll & Rooney who moderated the session Revitalization of Old Industrial Sites for Multiple Reuse. PA is now in the third generation of brownfield redevelopment. The first generation was removing the stigma of contaminated sites. In Pennsylvania and New Jersey, the first generation began roughly in 1995 with Pennsylvania’s passage of the Land Recycling and Environmental Remediation Standards Act of 1995 (Act 2). So the first generation may be thought of as one that lifted the stigma from formerly used and potentially contaminated properties. This enabled action to be taken on huge properties that had been mothballed by large industries; the sites were shuttered to avoid the stigma of Superfund liability. The second generation came when the Federal Government codified EPA’s Brownfield Environmental and Economic Revitalization Initiative into the 2002 Brownfield Law. Thus, the second generation involved the federal government entering into cooperative agreements with the states and providing financial incentives and a lifting of retroactive liability to allow mothballed sites to be cleaned up voluntarily. The third generation is settling the issue of co-existing remediated properties with a mixture of commercial and high-tech, light-industrial uses. With the right institutional controls, community outreach, and education, these light industrial reuses may be safely located close to residential redevelopment. The Pennsylvania Department of Community and Economic Development strategy for repurposing the 11 shuttered coal-fired power plants in the state includes “playbooks,” which are detailed marketing materials for each former plant that help bring together the energy companies that still own the sites and developers potentially interested in giving the properties new life. There are 14 power plants to be repurposed.